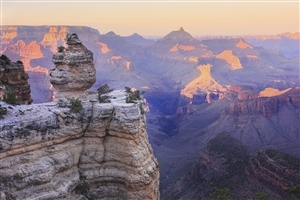 Some tours showcase cities, some focus more on the historical aspects of a location, this tour shines a spotlight on some of the most significant national parks in the United States, featuring a myriad of unique natural wonders in their stunning surroundings, perfect for those looking for a relaxing time in paradise settings. Your trip starts when you arrive in Las Vegas, with time after you have checked into your hotel to browse the shops, hit the slot machines or simply relax by the pool. 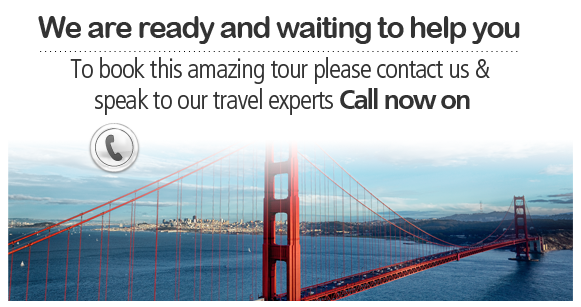 In the evening, you’ll then meet up with your tour director and your fellow travellers for a special welcome reception. 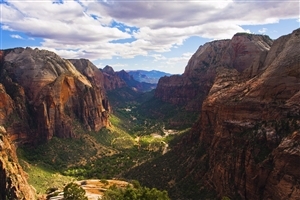 Travel away from the bright lights of Las Vegas to the stunning canyons and cliffs that are to be found within the Zion National Park. You’ll then continue onwards to Bryce Canyon, where you can marvel at the huge number of limestone spires that rise from the desert floor. Leaving the red rock canyon behind, you’ll head for the capital of Utah; Salt Lake City. On arrival, you’ll have chance to visit Temple Square, which is home to the headquarters of the Mormon Church and the Mormon Tabernacle Choir. In the evening, there is an optional visit to the former house of Brigham Young – an American leader in the Latter Day Saint movement – before dinner at the Lion House. Cross the Oregan Trail as you head for Wyoming, with a stop in Montpelier to visit the Oregan Trail Centre providing the opportunity to view a series of exhibits that tell the story of the route taken by pioneers in the past. After lunch, you’ll continue onwards to Jackson, with time at leisure to explore the town which sits in the shadow of the Grand Tetons. 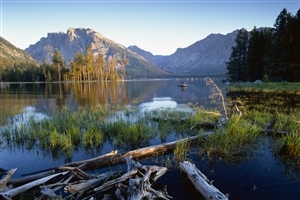 Early risers can enjoy an optional guided raft trip along the Snake River (seasonal) before crossing the Grand Teton National Park to visit Yellowstone; a national park famed for being the first in the world. A local specialist will be on hand to act as your guide as you explore spouting geysers and bubbling hot springs. Explore the impressive cayon of the Yellowstone National Park with its stunning waterfalls and the opportunity to spot some of the local wildlife. You can also marvel at the sight of the Old Faithful geyser erupting, with water arcing more than 100 feet into the air. Then there is the chance to relax under the stars when the sun goes down. Leave Yellowstone behind to head north towards the town of Cody, named after Williams Frederick Cody – more commonly known as Buffalo Bill. You’ll have chance to learn about the history of the town with a visit to the Buffalo Bill Centre of the West before heading on to Billings where you’ll enjoy true western hospitality with a ‘Be My Guest’ dinner experience with a local host. Head from Billings to Little Bighorn, the battlefield where General Custer and his troops were defeated in the Great Sioux War. You’ll then continue onwards to Rapid City for the overnight halt. Uncover the magic of the Black Hills with a trip through stunning scenery Mount Rushmore and the Crazy Horse Memorial. In the afternoon, you’ll head back to Rapid City where you can enjoy dinner alongside your fellow travellers. Travel through the beautiful landscapes of the expansive Wyoming grasslands en-route to Denver. After settling into your hotel, you can then enjoy the evening relaxing in the Mile High City. Travel to the foothills of the Rockies and cross the Continental Divide as you visit the large ski resort of Vail; a pretty alpine village famed for its old-world feel as much as its skiing possibilities. You’ll then continue onwards to Moab where you can marvel at the sun going down over the famous red cliffs of the area. An optional excursion could see you head out onto the mighty Colorado River for a exciting jet boat ride. 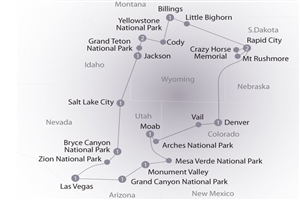 Embark on a busy day exploring two National Parks, with the opportunity to marvel at the stunning scenery of the Canyonlands National Park and to explore the way in which wind and rain have eroded sandstone over thousands of years to form more than 2,000 arches in the Arches National Park. Head away from Moab to the Mesa Verde National Park, where you can explore the cliff-top buildings and admire the huge Cliff House that are now regarded as a UNESCO World Heritage Site. 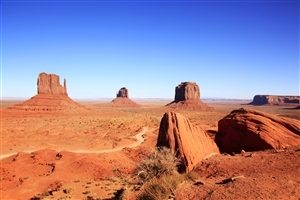 Enjoy a unique Navajo cookout and regional meal on the floor of Monument Valley before returning to your hotel to relax. Travel with a guide in an open air vehicle to take in the stunning sandstone landscapes of Monument Valley. Visit the land of the Navajo people and stop off at Cameron Trading Port as you head towards the Grand Canyon, with a local specialist being on hand to explain the geological processes that helped created it. A farewell dinner will be held at the end of the day. Those with a head for heights could take in a optional helicopter or plane trip above the Grand Canyon before you hit the road for the journey to Las Vegas and the end of your trip, stopping in Seligman and Kingman en-route.